The What: ViewSonic has begun shipping the latest in its View Board family of interactive flat panel displays. 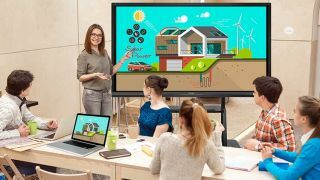 The ViewSonic IFP50 Series includes the IFP6550 (65 inch), IFP7550 (75 inch), and IFP8650 (86 inch) interactive flat panels with UHD 4K (3840x2160) resolution and 20-point touchscreen for collaborative experiences. The What Else: The ViewSonic ViewBoard IFP50 series are built with a 20-point touch-enabled panel, which allows multiple users to simultaneously write or draw on the display’s surface with styluses or fingers, or even both at the same time. These interactive flat panel displays feature built-in ARM quad-core processors and an Android 5.0 operating system, 2GB memory, and 16GB storage, allowing for annotation and multimedia playback without the need for a PC. The ViewBoard IFP6550, IFP7550, and IFP8650 are “out-of-the-box” ready, and come with ViewSonic’s vBoard embedded software and ViewBoard Cast collaboration software, as well as Zoom videoconferencing software. The vBoard software allows users to write, highlight, edit, and transform documents and images on the screen in real time. Built-in ViewBoard Cast software enables content to be shared from any mobile device to the ViewBoard display, while Zoom supports videoconferencing and distance learning for up to 10 users in various locations. vController software is also included, providing an intuitive interface for remote management. The ViewSonic ViewBoard IFP6550, IFP7550 and IFP8650 displays feature multiple connectivity options including HDMI, composite, VGA, YPbPr, SPIDF audio-out, USB 2.0 and 3.0, RJ45, RS-232 in/out, Windows slot-in PC, and audio in/out, to connect to a wide variety of computing and multimedia devices. Each has a brightness level of 350 nits, and the 8ms response time reduces visible image artifacts for clearer images. The IFP series also feature anti-glare 7H tempered glass for environments where interactivity and sharing are encouraged. The displays also help educators advance their curriculum with Qwizdom Oktopus and Ximbus Solutions. Oktopus collaboration software lets users annotate and work over and/or alongside any application, existing content, or over a web browser. Ximbus is a cloud-based collaboration and sharing solution for Google classrooms, and features Google Drive and content integration. The Bottom Line: Featuring UHD resolution, built-in computing including Zoom videoconferencing software, and 20-point touchscreens for collaboration, the IFP50 Series is well suited for a variety of environments where a plug-and-play solution is desired, especially boardrooms and classrooms.